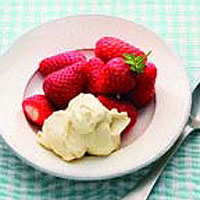 The subtle tanginess of Romanoff sauce really brings the flavour of strawberries to life. Mix 100ml crème fraîche, 3 tbsp light muscovado sugar and 1 tbsp Cognac together in a medium-sized bowl. In a separate bowl, whip 142ml double cream until it starts to thicken with 3 tbsp icing sugar and whip until thick. Using a rubber spatula, fold the cream carefully into the crème fraîche mixture until well blended. Just before serving, rinse 600g fresh, ripe strawberries and trim off the stems with a paring knife. Serve in shallow bowls with a dollop of sauce, or put the berries into stemmed glasses and top with the sauce. You could also serve this with a slice of chocolate tart.